As of today, nearly 50 billion apps have been downloaded worldwide. And we couldn’t have done it without you. So we want to say thanks. 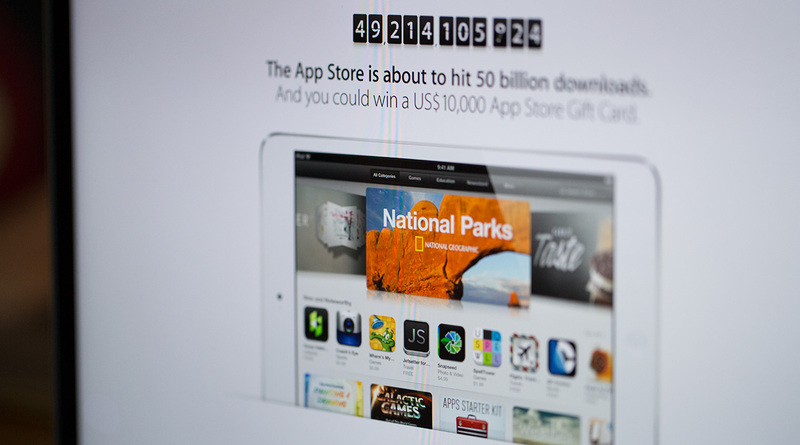 Download the 50 billionth app, and you could win a US$10,000 App Store Gift Card. Or download one of the first 50 apps after that, and you could win a US$500 App Store Gift Card. * Browse the App Store and download your next favorite app. Creeping decimalism aside, there's still 800,000,000 or so downloads to go at the time of this writing, so if you want more iTunes money than you could likely ever spend, get your prediction algorithms going and keep your finger on the download button. Anyone here just know they're going to win?